We have obtained some of the largest personal injury settlements and jury verdicts in the state of Illinois history. Due to our success records, we are able to force insurance companies and their lawyers to settle over 97% of our cases. We are caring and compassionate lawyers who are aggressive in the way we handle our cases. Our aggressive approach to our cases assures our clients the insurance companies and their lawyers will give your case top priority. We give all our personal injury, workers' compensation, wrongful death and medical malpractice clients a promise that if we do not recover monetary damages in your case, we will not charge you an attorney fee. If we take your case, we only get paid if we win. We offer a free consultation to evaluate your legal case. Nemeroff Law Offices was founded in January, 2000 by Chicago personal injury lawyer David Nemeroff. Mr. Nemeroff became an attorney after suffering his own serious personal injuries when he was hit head-on by a drunk driver. He went to law school while recovering from his injuries. After graduating law school, he worked for two prestigious plaintiff's personal injury firms for nearly five years before starting Nemeroff Law Offices. In January, 2012, David Nemeroff was named one of the Top 100 Lawyers in the State of Illinois by Super Lawyers Magazine, a Thomson Reuters publication. Chicago personal injury lawyer David Nemeroff has been recognized as an Illinois Super Lawyer by Thomson Reuters (Westlaw) and Chicago Magazine. 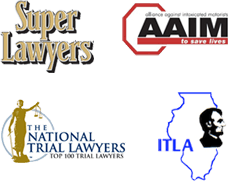 Super Lawyers honors the top 5% of Illinois lawyers in their area of specialty. He has been selected as a Top 100 Trial Lawyer in Illinois by the National Trial Lawyers Association. The Law Bulletin Publishing Company has honored David Nemeroff with the designation of "Leading Lawyer" in the state of Illinois in the areas of general negligence law and medical malpractice law. The top 5% of Illinois lawyers are included in this honor. He has also been recognized as a "Leading Lawyer" in Illinois by the Law Bulletin Publishing Company, publishers of the Chicago Daily Law Bulletin. We understand the key to success: hard work and thorough preparation of our cases. Our aggressive approach to legal representation assures our clients that insurance companies and their attorneys will take notice of the cases we handle and understand that if a fair settlement is not offered, we will be prepared to take that case to trial. The majority of the cases we work on are referred to us by attorneys, medical professionals or from our existing client base, a testament to the way we handle our cases. You can rest assured that your case will be given the attention it deserves, ensuring the best result possible. Nemeroff Law Offices has established itself as one of the leading personal injury, wrongful death, workers' compensation and medical malpractice law firms in the City of Chicago and State of Illinois. We handle personal injury, wrongful death, workers' compensation and medical malpractice cases in Cook County, Lake County, DuPage County, Will County, McHenry County, Kankakee County, Winnebago County and all other counties in the State of Illinois. We are also available to handle cases in other states with the assistance of co-counsel. Some of our cases have been featured on CNN, NBC News, Fox News, Chicago Sun-Times, Chicago Tribune, Daily Herald and the Chicago Daily Law Bulletin. Mr. Nemeroff has appeared on numerous television programs, including CNN, Fox News and Chicago Tonight. We hope you will contact us now to help you in your time of need. We will fight for your rights to ensure a fair financial recovery. Founding partner David Nemeroff has been named one of Illinois Top 100 Lawyers by Thomson Reuters, the country’s largest legal publisher. He has been named an Illinois Super Lawyer for many years and was selected as a “Leading Lawyer” in Illinois by the Chicago Law Bulletin Publishing Company. His passion was formed as a result of the injuries he suffered when struck by a drunk driver back in 1990. That fueled his desire to attend law school and, upon graduation, dedicate his career to representing people who were injured and families who had a loved one killed due to negligence of others. He has had numerous top settlements and verdicts in the state of Illinois. He has established records for compensation to his clients in medical malpractice cases, auto accidents, bus accidents and other negligence cases he has worked on.